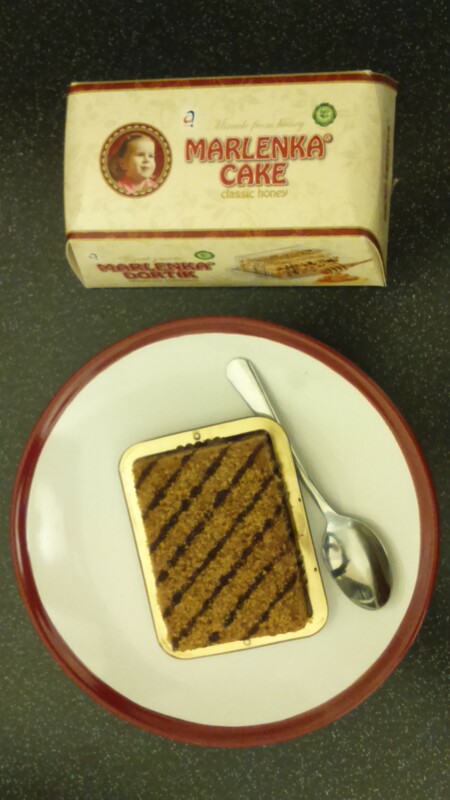 Tasty Thursdays: Marlenka – a delicious honey cake – Tasting the World – On the road, with stuffed hand luggage and face. Camera in my hand. This week I´m once again participating in the Tasty Thursdays blog event by Razel from World and Time Enough. The task is to write a post about the yummiest thing I´ve eaten/drank last week. This week I´m gonna tell you about the Marlenka cake. It´s a classic honey cake based on a traditional Armenian recipe. It´s produced in the Czech republic, where it´s very popular, you can buy it in many restaurants. I´m glad that I can get it even here in England – there is a website where you can order from (with a free next day UK delivery). The basic type of the cake is made from multiple layers of thin cake base with honey filling between them. On the top there are nuts and a bit of chocolate topping. The sides of the cake are also covered with the honey filling and that´s why I´m always hoping I get a piece from the corner or at least the side. They also sell the cakes with cocoa and lemon flavour. I have tried both and I still prefer the basic type, the lemon type being my second choice. You can choose from a whole cake (8 – 16 portions), cake nuggets (small balls), “baby” cakes (one portion) and snacks (small portion covered in chocolate). I had a piece for dinner today. It was the basic type baby cake. If you have a sweet tooth, you would love it.